The Sing vocalist's new album has gone straight in at the number one spot, making it the fastest-selling album of the year so far. 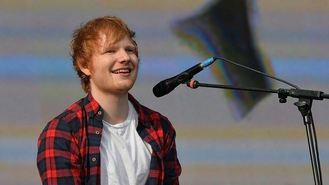 He snatches the crown from former record-holders Coldplay, whose album Ghost Stories sold 168,000 copies in the first week of its May release. But Sheeran's album X has shifted 182,000 copies this week. It is also the first time the official singles chart has counted songs played on streaming services such as Spotify and Deezer. Dutch DJ Oliver Heldens and British singer-songwriter Becky Hill hit the singles top spot with their collaboration Gecko (Overdrive). It knocked X Factor contestant Ella Henderson's debut single Ghost a notch down to number two.